This past weekend I had the pleasure of representing Patchwork Quilts at the Sapphire Quilt Club's Quilt Show. It was hectic for me, trying to decide what to take, what to share, how I could differentiate Patches from the other quilt shops. I came away with a "shop owner’s" perspective that surprised me and I wanted to share it. First of all, it was not about Patches or the products that I worried so much about. It was about my FRIENDS sharing their precious projects with the world! I arrived early Saturday morning so I could have time to see the exhibits. In the quiet of the gym I heard the squeals of joy as someone just saw they received a ribbon. My mind flashed back to the first time I ever won a ribbon and my heart soared with her. My heart soared even more when I saw how my friends had graciously allowed me to be a part of their treasures. Many of the fabrics brought back memories of when it was purchased and some of the many opinions on which ones would be best. Several of the projects came out of our classes. Laughter, chocolate, and a few "oh darn's" come to mind. There is nothing more satisfying to me than to see a student take a technique we taught them to the next level. That is what makes it all worthwhile and I thank you all from the bottom of my heart. In the meantime...it’s time to start another project. Flip Flop Christmas is an excellent place to start. 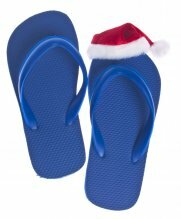 Tomorrow (10-5) and Saturday (10-4) we will be having our 7th Annual Flip Flop Christmas event. 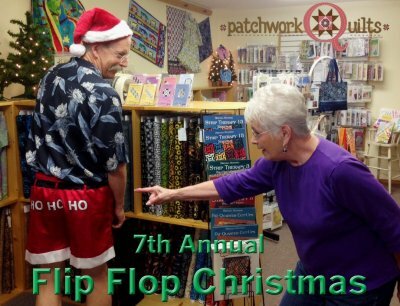 So, slip on your flip flops and come on down for 2 days of fun, great sales, demonstrations, door prizes (you must wear flip flops to register), and much, much more. Santa will be serving FREE hot dogs both days from 11:00 to 1:30. 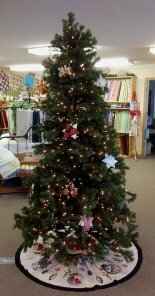 Along with many other event sales, we are also having a special Christmas tree decorated with beautiful fat quarter star bundles. Purchase one of these stars and receive up to 40% OFF all of your other Christmas fabric. For all of you out-of-town shoppers who won’t be able to attend this popular event, just use Promo Code FLIPFLOP when you checkout online and receive 20% OFF your entire order Friday and Saturday. Remember, spend over $35 on merchandise and your domestic shipping is FREE. And, as always, there is NO Sales Tax at Patchwork Quilts. Have a great rest of July and we hope to see you this weekend.